After a long hiatus, we are finally ready to starting moving forward again. A few things slowed us down. We spent some time in NY, Zac had several business trips, plus the weather has been weird in CO. It has been either raining like crazy or hot as hell here. The whole time I have been sneezing my head off too which is a real buzz kill. Anywho! After posting on Craigslist, we got a dude to come and take all of our bus seats to scrap them. We got a clean garage and he got some easy cash. I call that a win-win. Now that the garage was clear, what else was there to do but to fill it up with crap again?! We put our first round of yard sale junk in the garage and had it all on display bright and early yesterday morning. I think it was a success! 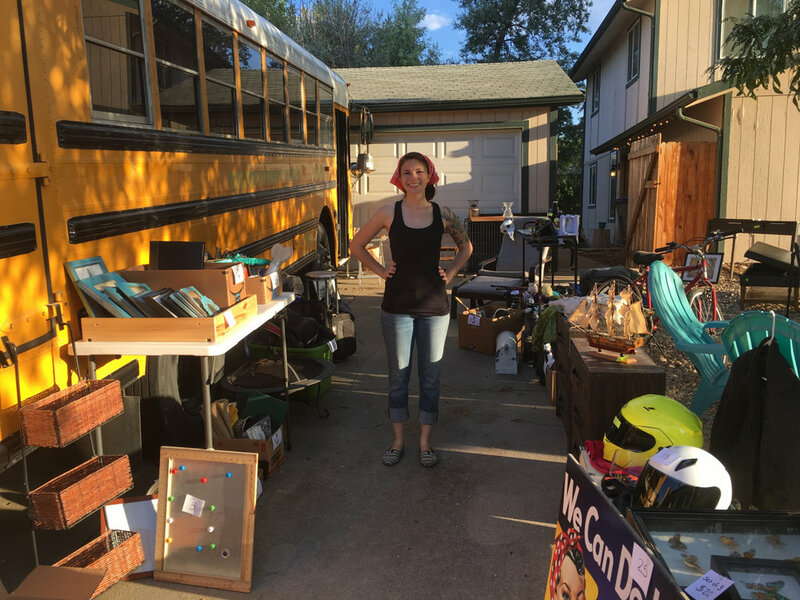 We got rid of 1/2 the stuff you see in the photo, made $200 and even made some new friends! Lots of people came by and everyone was interested in the bus. We left the door open and invited people to have a peek. I’m hoping more and more people will turn out for each future sale and we will eventually be rid of all of our stuff.